What if your customers could buy what they want when they wanted it? That’s still a surprisingly tall order in the current world of unpredictable consumer behavior and roller-coaster demand. And it leaves you explaining why that hot, new, must-have on backorder won’t ship for at least another week. The fallout is not just a lost sale ... or even a lost customer ... but the brand damage from that 2-star review the customer left behind. What if you had a more up-to-date picture of consumer behavior? What if you could anticipate more of the spikes and dips driven by external factors? What if you didn’t have to rely on last year’s Black Friday statistics to predict this year’s sales? What if your demand planning solution never needed another expensive on-site technology upgrade? 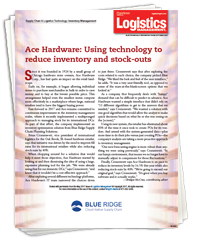 See how Ace Hardware decreased inventory by 16.5% & reduce stockouts by 40%.